An upgrade of the Court Lights to use LED Lights. These will be retrofitted to the existing poles. The installation of the Tennis Australia Book a Court System. The Book a Court System is an initiative of Tennis Australia that allows members of the public to book a court at the Club to play on. Payment is processed online and access to the Club is granted through a supplied Code. The Code is entered on a Key Pad that will be placed on a new gate that will be installed on the right of the Clubhouse as you enter. When Members wish to access the court for a social hit will need to go online and book a court. If a booking is made during the evening a fee will be required during the booking process for the lights and a Code will be issued via Email to access the lights. This is required to avoid clashes and to inform members of the availability of the courts. Coaching and Competition times will be blocked out, no bookings will be accepted for these times. Members will still be able to use their existing keys to enter the club. However if the lights are to be used the issued Code must be entered on the Key Pad to activate the lights. For those playing night competition a Code will be issued for the entire Club to activate the lights during the defined period. If this PIN is not entered the lights will not activate. There will be more information and training available over the coming months and the Club aiming to make this process as straight forward as possible. 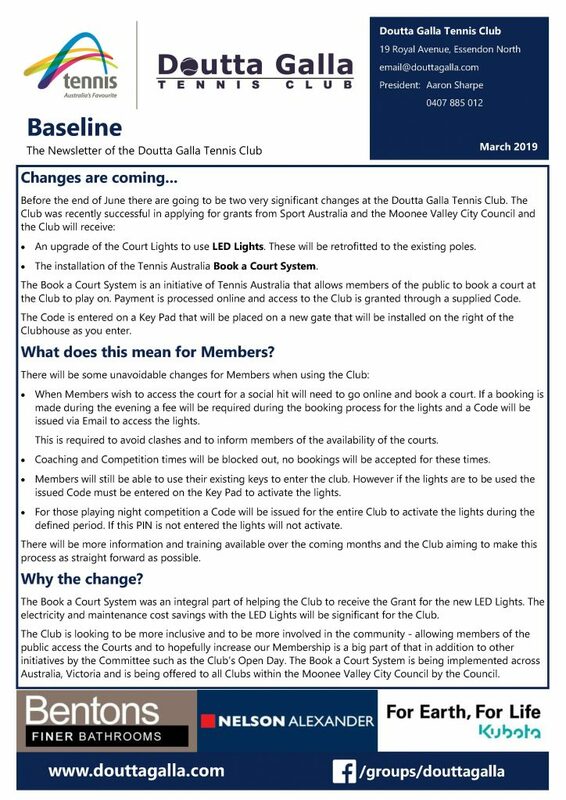 The Book a Court System was an integral part of helping the Club to receive the Grant for the new LED Lights. The electricity and maintenance cost savings with the LED Lights will be significant for the Club. The Club is looking to be more inclusive and to be more involved in the community – allowing members of the public access the Courts and to hopefully increase our Membership is a big part of that in addition to other initiatives by the Committee such as the Club’s Open Day. The Book a Court System is being implemented across Australia, Victoria and is being offered to all Clubs within the Moonee Valley City Council by the Council.